Give your hair a botanical boost with warm golden tones! 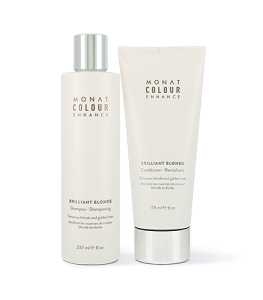 To learn more about Colour Enhance Brilliant Blonde Conditioner, please contact your MONAT Market Partner. For blondes and those with light-to-medium shades of hair. Illuminates and enhances blonde and golden hues in light-to-medium shades of hair. Formulated with a complex blend of botanical extracts and phyto pigments to boost lustrous golden highlights and to beautifully enhance color. 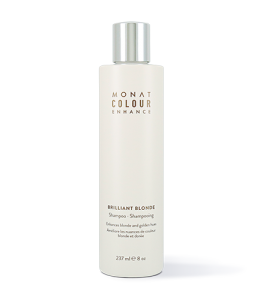 Shampoo with MONAT Brilliant Blonde Shampoo, rinse. 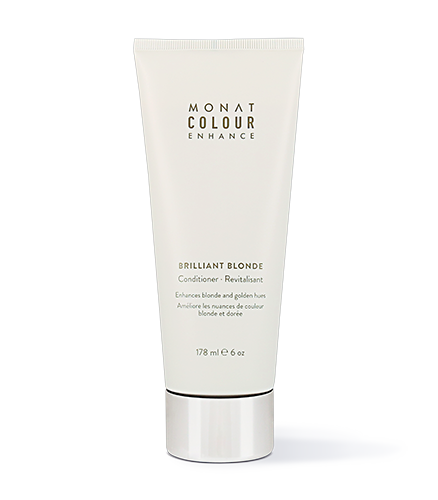 Apply MONAT Brilliant Blonde Conditioner, work it through to the ends of the hair. 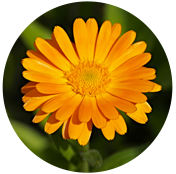 Phyto pigments derived from Crocus Flower, Turmeric Root Extract, Chamomile Flower Extract, and Marigold (Calendula) Flower Extract - to enhance golden highlights and boost color vibrancy.